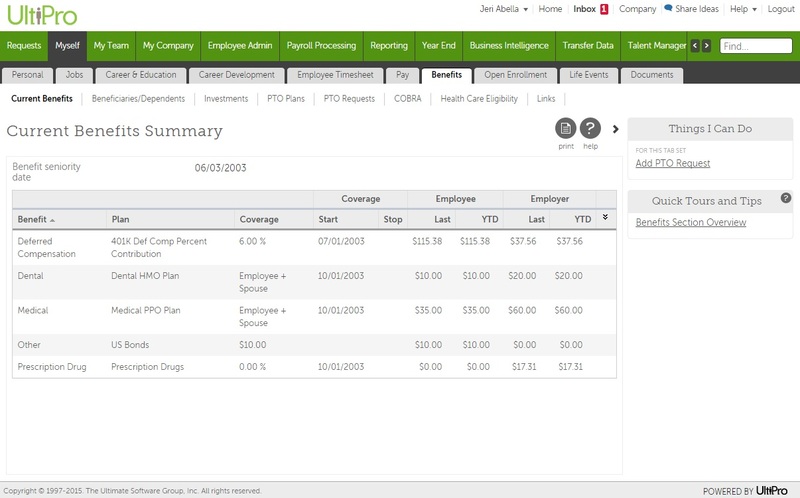 You can manage all your employee benefits with efficiency and ease in UltiPro. UltiPro delivers an intuitive benefits experience for both HR and employees, and employee data is seamlessly transferred from UltiPro HR and payroll solutions, ensuring data accuracy and improving productivity. 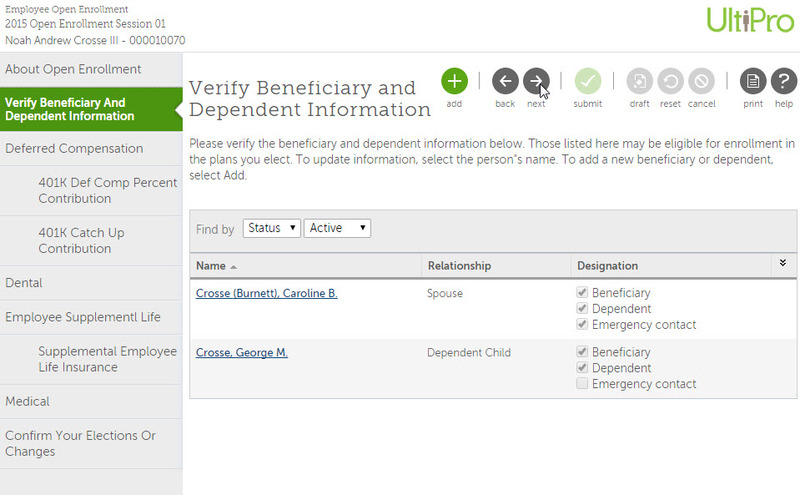 You can configure UltiPro to match the benefits that you offer employees, set up and administer benefit plans, and enable employees to easily check benefit options and coverage. Our Onboarding Product Tour may interest you. UltiPro Open Enrollment significantly reduces the time and expense associated with administering employee benefits with paper enrollment. By automating the open enrollment process online, UltiPro minimizes paperwork for HR and benefits professionals, plus helps you decrease costs and go “green” by eliminating the need to print and distribute tedious forms. UltiPro makes it easy for employees to understand what their benefit options are so they can make the best choices for themselves and their families, independently, and rely less on HR. Employees review benefit options and make elections from anywhere. 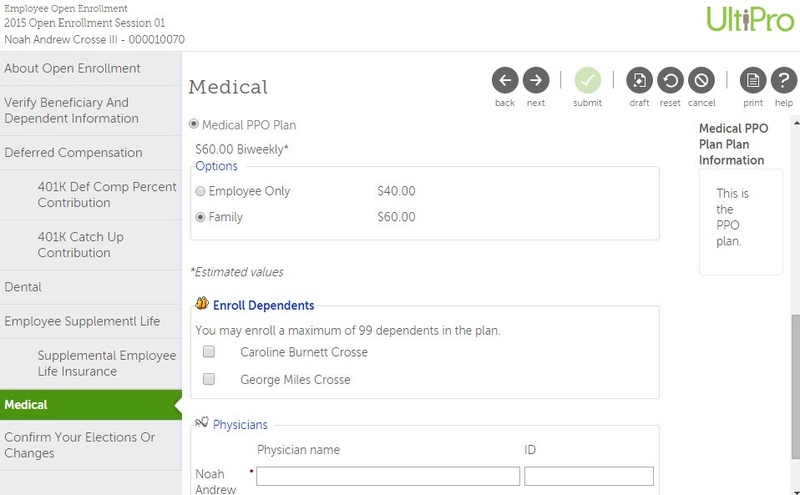 Benefits administrators enjoy easy setup of open enrollment sessions, including the flexibility to customize content and messages for employees and set up plan contingencies — For example, employees can’t enroll in a Health Savings Account unless they have chosen a high-deductible insurance plan. Administration tools allow HR or benefits managers to monitor session progress at any time. Because UltiPro is a comprehensive solution, employee benefit elections and ensuing deductions are processed in one system—no reconciling necessary. UltiPro Life Events simplifies life-event changes by allowing employees to make their own updates to benefits and personal information, online. The intuitive solution guides employees through all the steps of making life event changes, such as getting married, having a baby, or moving — with no paperwork or assistance from HR needed.